No sooner do I extol the virtues of a Tasmanian Autumn than Murphy's Law kicks in and we get a week of heavy overcast and very still, weather. On the face of it, still conditions should be good for birding, but I know from my days as a bird bander, such conditions seem to reduce the movement of birds considerably. The upshot of the conditions was that they effectively grounded me too, as they were not very conducive for photography either. So this morning, with conditions slightly improving, I set of in search of Cattle Egrets. These egrets are fairly common in Tasmania during the cooler months, but in the South of the state the flocks are ge nerally smaller than those in the North and North West, often only numbering in single figures. I get the impression that the numbers in the South have declined somewhat, possibly as a result of the drought conditions on the Mainland. I drove up the eastern shore of the River Derwent, noting a few Cattle Egrets in paddocks between Bridgewater and New Norfolk. On the northern outskirts of New Norfolk, in an irrigated paddock next to the main road, I came across a group of three feeding. This spot usually has one of the larger flocks, often numbering up to 20 birds, but today I could only find three. I spent half an hour or so observing and photographing them. Although this is a dairy property, the egrets usually prefer to feed in paddocks that have been set aside for future use and sporting relatively long grass, rather than among the cattle. I was interested to know what they were feeding on, and for the most part, it appeared probably that they were catching insects, but I did photograph one with an earthworm (middle shot), which surprised me. On returning, I looked up this egret's diet, which, in Australia as I guessed, was recorded as primarily grasshoppers, crickets, spiders, fish and frogs. I did find a South African source that mentioned earthworms as a major part of their diet during the Winter months, so it's probable that in suitable conditions, earthworms are important here too. On the drive back, I called in briefly to Gould's Lagoon, and noted the 'usual' Great Egret there. Perhaps more noteworthy was that there were several Clamorous Reed Warblers still present, some calling. It's generally thought that they leave Tasmania in March. No I'm not going anywhere, (although I'm seriously contemplating setting up a website as an adjunct or perhaps even in place of this blog). No, this is about , for me at least, a rare event that I witnessed on Friday morning. Friday was one of those top shelf days that we get during a Tasmanian Autumn. Clear blue sky, no wind, and the only decision to be made was where to go. I chose Marion Bay Spit, which I fondly felt that with a rising tide, would produce a good chance of waders and gulls in good numbers. From that perspective, the morning was something of a let down. True I did find a lone male Flame Robin hawking from the fence as I approached, and a solitary Sooty Oystercatcher feeding amongst the recently beach cast kelp. Nearer the spit I found a few Pied Oystercatcher and a single Doublebanded Plover. Around 20, mostly adult Pacific Gulls at the spit, and numbers of Crested Terns and Black-faced Cormorants flying to and fro in the channel, rounded off the sightings. I turned for home, noting as I did a few Crescent Honeyeaters calling from the last few bushes on the southern end of the dunes. Having recently missed out on photographing them, I thought I should look a little closer. Well after several minutes watching mostly Crescent and New Holland Honeyeaters in these shrubs, I realised what they were up to. A few individuals were taking up position at the top of the bushes and spending some few minutes looking around and when they thought it was all clear, taking off across the mouth of Blackman Bay, to the southern side, a distance of around 800 metres. This in itself would probably not be worth mentioning, but in the approximately 45 minutes I watched, well over 300 individuals made the journey. Mostly each group consisted of no more than 10 birds, but as they set off they were quickly replaced by the next group from amongst the low acacia scrub that covers the dunes. Every now and again a few Eastern Spinebills, such as the one at middle right, would climb to the shrub top, look very warily around, and then head off, often followed by others that had hitherto remained concealed. The Spinebills were more prone to having second thoughts and several times they aborted the attempt and hid back in the acacias. These 'movers' were mainly Crescent and New Holland Honeyeaters, and Eastern Spinebills, and they would travel in mixed species flocks, but other species that tagged along included Silvereyes and Greenfinches. An altogether interesting morning and one of the few occasions that I could be sure that the birds were truly involved in a 'movement'. From my experience, a rarely sighted event here in Tasmania. To top it off, I also got my shots of a Crescent Honeyeater (male, top right), not forgetting the adult New Holland Honeyeater (bottom right). As I drove back along the access track, I also noted several Striated Fieldwrens, definitely a morning to remember! During a visit to the Cape Deslacs Reserve near Clifton Beach a few days ago, I had an encounter with, what was most probably a pair of, Striated Pardalotes. The area is largely coastal heath, but in some areas this is slowly being overtaken by Peppermints. I had staked out a flowering bansksia, in the hope of photographing one of the numerous, and newly arrived Crescent Honeyeaters. I hadn't been there long, when I heard a flock of Spotted Pardalotes approaching. I fondly hoped that they might give me an opportunity to photograph them, but as usual they were feeding in the canopy of the eucalypts, and smartly moved on. 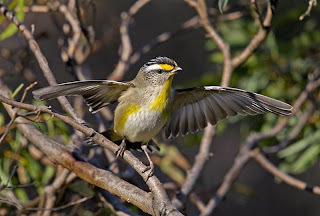 But almost immediately, two Striated Pardalotes appeared only a few metres away from me. In the next several minutes (I rather lose any sense of time when I'm photographing birds) they proceeded to give me the 'once over'. They seemed very agitated by my presence, something I could expect during their breeding season, (they breed in substantial numbers in this area) but we should be way past that by now. As you can see by the image at upper left, the agitation included displaying with wings open. Well whatever the reason for displaying, it did give me a great opportunity to photograph them, which was some consolation for missing out on the Crescents. Oh well, I have the next several months to remedy that. I have spent several hours in the heath around Goat Bluff in recent times and published some of the observations on this blog. This visit was while on the way to a family outing at South Arm. I suggested we might stop and show the elder of my daughter's children, Caitlyn, all of 6 years old, the magnificent views from the lookout (and I might just get a few minutes birding in). It was a very blustery day with intermittent cloud cover and there were few obvious birds about. We did get a distant view of a young White-breasted Sea Eagle floating above Hope Beach to the West but little else, so we quickly returned to my daughter's 4WD. Just as I was getting back in, she remarked that there was a bird atop a low shrub on the cliff edge about 20 metres away. There had been so few bush birds about, that I took keener interest than usual, and even with the naked eye, immediately realised it was a Striated Fieldwren. I grabbed the camera and 'begging' an indulgence of a few minutes of the family's time, headed for the bird. It's not that they're particularly uncommon. I had briefly heard one here on a previous trip, and when I had a banding site close by , had caught a few over the years. No, it's just that I seldom see them, or if I do, it's a brief view as one passes from one piece of low cover to another. I've even seen them go into a lone bush, circled round and round it trying to flush the bird, all to no avail. But today they seemed eager to show themselves, and I managed the accompanying shots in about a quarter of an hour, as I wandered through the low scrub, much of it less than a metre high. They're fascinating to watch, sometimes flying from bush to bush with much whirring of wings, their wings seemingly too small for their fairly corpulent bodies. At other times running rapidly across the open spaces between cover. In an area of no more than a hectare of windswept clifftop, I estimated there were perhaps as many as a dozen birds. Why they were so active under the blustery conditions I don't pretend to know, but they are early breeders and they may just have been staking out their territories. I can only feel grateful for the brief acquantaince. A bird the family now refers to as "Vanessa's Bird". I'm just glad she noticed it! For the second time in a few days, I have come across Chestnut Teal with young. These were photographed at Sandford this morning, on a farm dam. They are wild birds. I don't recall seeing wild duck with young at this time of year before, and it's slap in the middle of a duck season that went ahead, despite being banned in other states. In my estimation, it went ahead purely for political reasons. Surely in this day and age, duck shooting should be a thing of the past. Go out with a camera instead perhaps! South Arm--Underated Birding Hot Spot? My last two articles made me realise the area that I loosely call South Arm, the peninsula at the southern end of the eastern shore of the Derwent River, has as good a list of birds as anywhere in the state. I consider all the area to the south of the Clifton Beach turnoff, to be part of the area mentioned. A rough list produced a total of at least 120 species, which includes a significant number of oceanic and beach washed species. One thing going for it is the variety of habitats, including lagoons, mudflats, woodland, heath and ocean beaches. Can anyone nominate a better total for a similar sized area of Tasmania? As promised, I've chosen a few of the many images I have taken recently in the heath around Goat Bluff (on the South Arm peninsula). Many birds are drawn here by the flowering Banksias and Correas, either for the nectar or for the insects that are similarly drawn to the flowers. The most numerous are undoubtedly the Silvereyes, with flocks of 10 to 20 or more, commonly seen. I chose a shot of a Silvereye that shows the chestnut flanks of the Tasmanian sub species. The next most obvious are probably the Crescent Honeyeaters, (female pictured at upper right). At this time of year they move from the higher altitudes and wetter areas, into heath, parks and gardens. Some species are just passing through, like the Black-headed Honeyeaters (third from top at left). Small flocks regularly pass through, stopping briefly, seemingly to noisily gather the flock together, before flying off to nearby eucalypts, their preferred habitat. The Eastern Spinebill (photo top left), feed almost exclusively on a small, ground cover plant, very prickly, with small bell shaped flowers, the name of which escapes me. 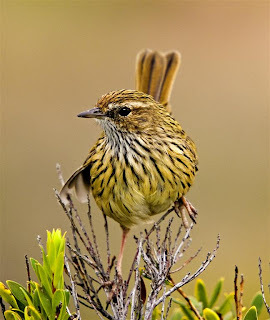 Occa sionally, if they hear an alarm call from other birds, as many as five or six may briefly gather together in some nearby shrub, a rare sight for a generally solitary bird. Other species seen in the heath included Little Wattlebird, Grey Shrike-thrush, Scarlet and Flame Robin, Green Rosella, Musk Lorikeet, a solitary Tree Martin, Yellow-throated Honeyeater, Golden Whistler, and surprisingly, only the odd New Holland Honeyeater, a species that is normally here in substantial numbers. Lastly, but numerically not least, there were numerous groups of Brown Thornbills (bottom right), and Superb Fairy-wrens (bottom left). Coastal heath is invariably a good area to bird at this time of year, and this venue is no exception. The last few days or so has seen some cold starts followed by magnificent days. I have spent the last few mornings wandering through the coastal heath, just enjoying the conditions and of course, the birds. This time of year there's an influx of birds into these areas, the catalyst is primarily the flowering of the Banksias, in this case marginata, the sole flowering bansksia in Tasmania, apart from a few isolated pockets of serrata in the NW. The banksias not only provide food for the nectar eating species, but attract many insects. On Goat Bluff, where the accompanying images were taken, I have been greeted each morning by the Flame Robin you see here. I suspect the updraught at the lookout, perched as it is on top of the cliff, provides an early morning feast, esp ecially when most insects have been grounded by the cool start (we're talking about single figure degrees Celsius). As you can see by the unflattering shot of the male Flame Robin, puffing one's feathers up to maintain body temperature is de rigueur, but I'm not sure what it's going to do in the Winter! I've added a 'normal' shot (at left). Perhaps like other Flames, it will head for the Mainland. This Flame and accompanying female, were the only Flames that I found during several hours of walking. By far the most common robin was the Scarlet, and the bird seen below, was only one of about a dozen or more that I came across. Almost all were conspicuously calling from some vantage point, giving plenty of opportunities for photography. Surprisingly, I didn't see a single Dusky Robin in my wanderings, and I know that they have regularly bred on the bluff in the denser areas of heath. Needless to say, I also took photos of a number of other species which I'll blog later. Are You a 'Lister' ? It a long time since I bothered keeping a written list of birds for specific sites or even a grand total. In fact on the occasions when other birders ask me how many species of birds I've seen, I usually make some noncomittal answer or give some vague number. The question is usually asked by someone who's seen far more than I have, keeps impeccable lists and is often the prelude to telling me just how many species they've seen. It's a wonder that I don't keep lists. In my youth, not telling you how lomg ago that was, I kept lists of many things. I stood on the street corner collecting tram and trolleybus numbers. I have a 1954 copy of "The Field Guide to the Birds of Britain and Europe" bought for me at that time by my parents. It's rather dilapidated, but contains lists and totals of my early birding. I seem to recall that this was the first British field guide and was possibly the catalyst for the surge of interest in birding in the UK. It was a big leap up from my Observer's Book of British Birds that I had previously relied on. These days I rely on my memory to list birds, something that with age, is becoming somewhat less reliable. You may well be wondering what this all has to do with the images of a Black Currawong. Well, if my memory is correct, this is the first one that I've recorded in the South Arm area, at Goat Bluff to be precise. I spent a couple of hours walking aro und the bluff this morning, recording 38 species, boosted by a few seabirds and waders. Most of the area is coastal heath and two of the commoner shrubs, Banksia marginata and Correa alba, are both in flower and attracting many birds. I spent some time waiting at one banksia as I attempted to photograph a succesion of visitors. They included, Crescent Honeyeaters, almost exclusively female, New Holland and Yellow-throated Honeyeaters, Eastern Spinebill, flocks of Silvereye and Brown Thornbills. Small flocks of Yellow-tailed Cockatoos passed nearby and last but not least, the lone Black Currawong pictured. I photographed it as it passed up and down the bluff and I got the impression it was lost. Whether that was really so, or why I thought that, I'm really not sure. There are Grey Currawongs in the area, especially so in the woodland above the bluff, but I've only rarely seen them in the coastal heath and nearly always during the Winter months. Perhaps I really should start committing my lists to paper. I paid a whistlestop visit to Five Mile Beach (close to Hobart Airport) at the weekend. I had intended to walk through the pine forest, but first scanned the bay, largely to see whether the Eastern Curlew were present. They weren't, but there were around 60 Bar-tailed Godwit, in two groups. The majority were feeding around the creek outlet, and the remainder roosting on a nearby sandy beach. Among the feeding flock were a few individuals showing a fair bit of breeding plumage, as in the upper image, but as the group shot shows, many were showing little or no colour. I wasn't able to get very close before they were spooked by passing horse riders, and although they returned later, together with 2 Eastern Curlew, I opted not to disturb them further. There's an interesting website www.werc.usgs.gov/sattrack/shorebirds/ that's well worth a visit. This website relates to the satellite tracking of 16 Bar-tails Godwits t hat were captured in New Zealand during February. It includes photos of the solar powered transmitters fitted to their backs. Somewhat surprisingly, some of these birds are well on their way to their breeding grounds in the Arctic Tundra. I say somewhat surprisingly, as most of the local birds appear to be still here, and many show little change in plumage. The website shows the movements of individual birds as they migrate. My son, Matthew, (Illinois Birds blog), rather more 'web savvy' than I am (who isn't), tells me that he's tracked some of the birds on Google Earth. He averaged out the speed of 3 birds. One travelled 2,318 kms in 38 hours, averaging 61km/hr, a second, 2,926kms in 42 hours, averaging 69.7 km/hr and the third, an incredible 3,762 kms in 47 hours at 79.3km/hr, no doubt with a seriously strong tail wind! The key to these significant journeys is the laying down of fat reserves. That highlights the need for these birds, and waders in general, to have access to areas of our coasts were they can do that, and roost, without constant disturbance.